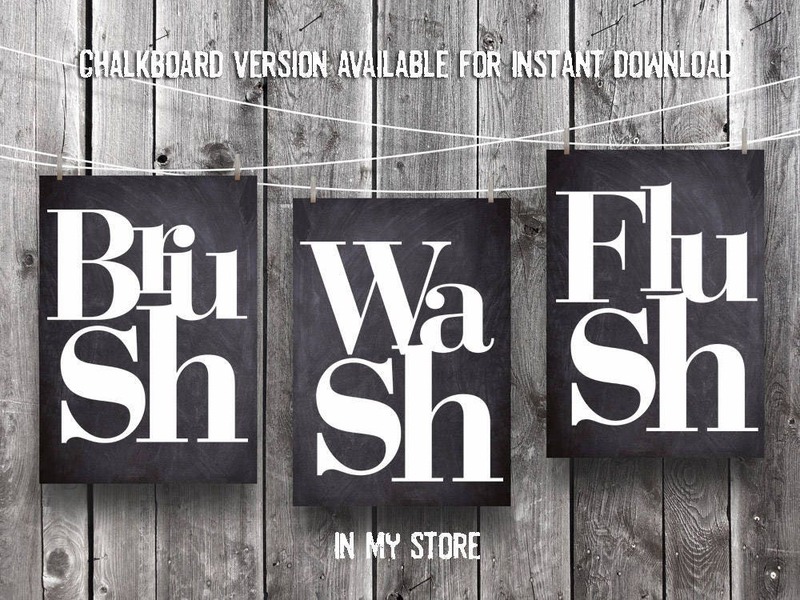 FULLY CUSTOMIZABLE Bathroom Wall Art Bathroom Artwork - Brush - Wash - Flush Bathroom Wall Decor Bathroom Art I can match any color scheme! Are you looking for some cute bathroom artwork that will remind your kids or guests about your "Rules of the Bathroom?" and that matches YOUR DECOR? Look no further! Included in this listing are 3 pieces of custom colored artwork that have been digitally created and are ready for you to download them and print them at home or at any local photo lab - for an additional fee, I can also print and ship this artwork directly to your home! In a message to me simply message me and attach a screenshot of the color scheme that you'd like me to create your artwork in (or a photo of your bathroom if you'd like my professional opinion) and I'll create your custom artwork! Listing includes 3 .JPG (photo) files with the color scheme of your choice that you can print yourself. THIS ARTWORK IS ALSO AVAILABLE AS "CHALKBOARD" ARTWORK FOR IMMEDIATE DOWNLOAD IN MY STORE, JUST CLICK HERE!